Amanda la monica – The WedLab! Amanda La Monica is a highly sought after bridal hair and makeup artist, renowned for glamorous, yet natural looking makeup that lasts all day. Amanda ensures you achieve the look you want on your wedding day, personally attending to each and every bride herself. With 15 years of experience she averages 100 weddings each year and has been voted Designer of dreams ABIA No1 makeup artist in AUSTRALIA among other awards! Amanda prides herself on keeping up to date with current trends and styles in everything hair and makeup and has the education, experience and talent to be able to envision the look you want to create and tailor it to suit you. Offering beauty packages to compliment her hair and makeup service if needed, Amanda is the one contact needed for designer eyebrows, glowing spray tan, hair and makeup all mobile to you -especially great for destination weddings! 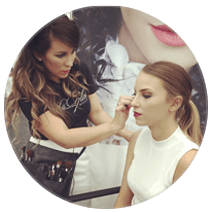 Amanda's makeup studio is located in Shellharbour and her mobile hair and makeup service caters for Sydney/Wollongong/South Coast/Southern Highlands. Amanda stocks the most beautiful Swarovski crystal and freshwater pearl jewellery. Including Hair pieces, Tiaras, Headbands, Hair Pins, Necklaces, Bracelets, Earrings.